Exercise recovery is an important part of the health equation: recovery is crucial to help alleviate soreness, restore energy, and ensure exercise adherence. Post workout nutrition: why is it so important? It’s simple. Each time you workout, your body loses critical vitamins and minerals - so it is important to replenish and rest after every workout! How much of each of the "Four R's" does a body need? It varies from person to person and depends on the type, intensity and duration of the activity. At the very least, eat a small nutritious snack after each workout. It's great to have a quick and easy post recovery snack food within your grasp after each workout, like a banana or a few peanut butter crackers. But it's also nice to have a few simple DIY snacks you can make ahead of time to add a little variety. So I asked my friend Sadie Roy, who is an amazing chef, and my friend Margaret Kennedy, who sells Pampered Chef, to show me a great DIY recipe and the tools to help get the job done! 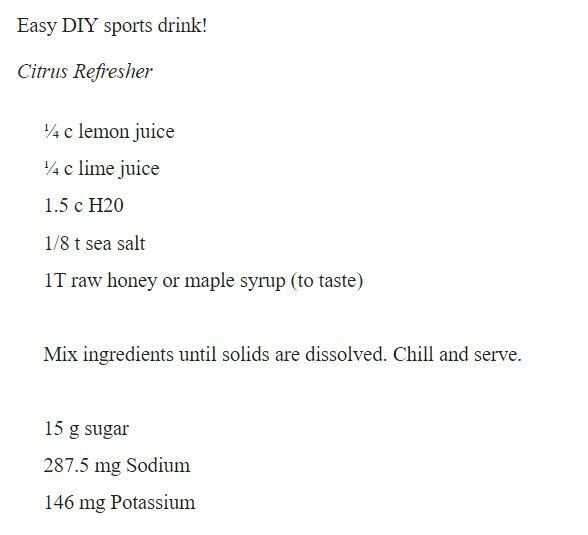 The Raw Balls are delicious and nutritious, and the Citrus Refresher is very uplifting, but it is very tart, so you may want to adjust the recipe according to your taste! The following recipes go together quickly and provide all the ingredients for optimal post-exercise recovery! Don't forget the Rest & Recovery! The body needs to adapt to the stress of exercise. Adequate recovery is necessary as it allows the body to replenish energy stores and repair damaged tissues. Since the amount of rest and recovery needed is very individual, LISTEN to your body: are you incredibly sore? ; are you exhausted? ; do you have no energy ... for days? It is imperative to allow enough time between workouts to help maximize recovery and minimize injury and soreness - allowing people to get back out there and do it all again! ...because they feel really bad afterward. But with the proper approach to exercise, proper nutrition to support the demand of exercise, and plenty of rest, the rewards of exercise experienced in the mind, body and spirit - far outweigh the minor unpleasantries! Jami Hanna holds a BS in Health, Fitness and Leadership and is an ACE Certified Personal Trainer. She is passionate about helping people age gracefully and improve quality of life through healthy lifestyle choices. Newer PostOptimize Muscle Mass: Fight Sarcopenia with Exercise and Protein! Older PostI don’t really want to die, I just want the pain to end.